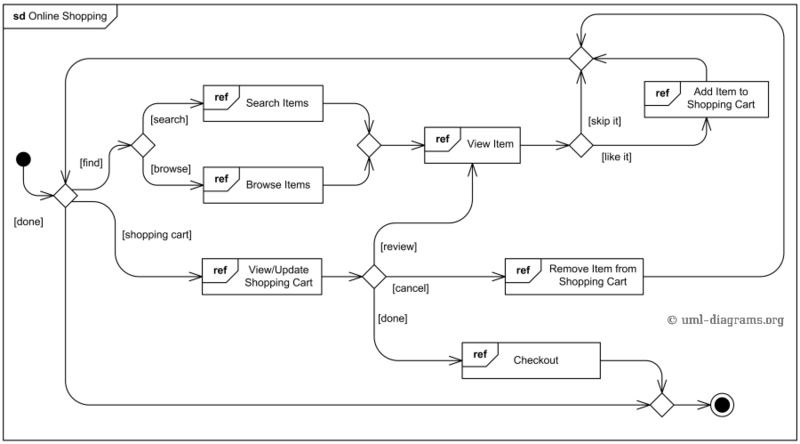 Online shopping UML interaction overview diagram example. An example of interaction overview diagram for online shopping. Customer may search or browse items, add or remove items from shopping cart, do checkout. An example of UML interaction overview diagram for online shopping. This interaction overview diagram is enclosed by sd frame (abbreviated form for all kinds of interaction diagrams). All non-control nodes of the diagram are references to interactions - interaction uses.